General Characteristics: Medium in height, well spreading, maturing within 9 to 12 months, producing from 2 to 5 oha; distinguished by lilac-purple corm flesh and reddish-purple flecked stripes. Petiole: 65 to 90 cm. long, light yellowish-green with dark purple or reddish-purple flecked stripes and blotches, dark red at edge, reddish-purple at apex, a dark reddish-purple ring at base with purplish-pink for 3 to 4 cm. above. Leaf blade: 50 to 65 cm. long, 35 to 45 cm. wide, 40 to 50 cm. from tip to base of sinus, ovate, dark green with bluish cast; margins undulate; piko purple; veins conspicuously reddish-purple over entire lower surface; lobes acute with wide sinus. Corm: Flesh light lilac-purple with darker purplish fibers; skin dark pinkish-lilac. 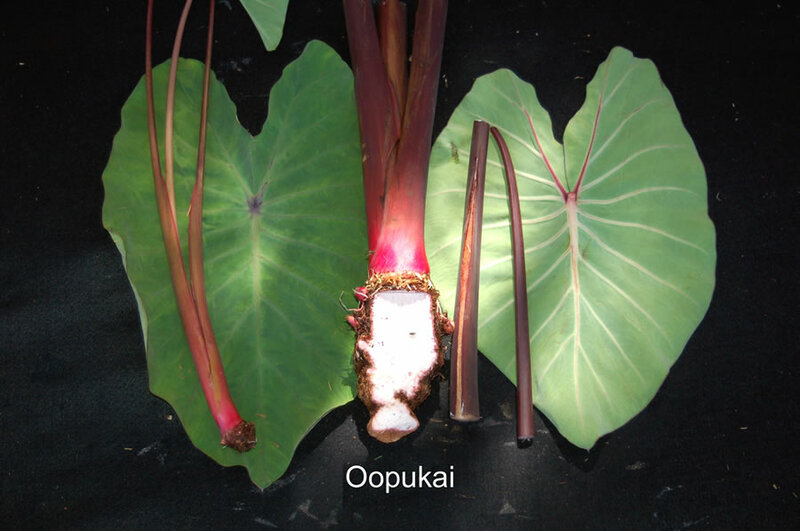 Origin, and derivation of name: Native variety; Oopukai means "sea guppy," a fish similar in coloring to the petiole of this taro. Distribution: Planted fairly extensively in Kona, Hawaii, primarily under upland culture, but found only occasionally on the other islands. 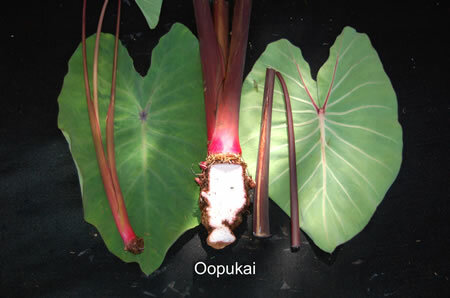 Use: Mainly as table taro; the leaves are often used for luau. Remarks: Although good poi can be made from this variety, it cannot be stored as long as poi from other taros due to over-rapid fermentation.